Kay Mellor – successful actress, scriptwriter and director; Yorkshire born-and-bred; and a name synonymous with high quality television drama. There won’t be many people in the UK who haven’t heard of her or watched at least one of her productions. That may go some way to explaining the near sell-out crowd at Hull New Theatre on a dark, dreary Monday night in January. Kay Mellor’s Fat Friends The Musical has been on the road for a couple of months now, having had its premiere in Mellor’s home city of Leeds last November. With more dates stretching out for the next six months, this is a tour and a half – and having enjoyed every minute – I can see why. For those who remember the TV show of the same name that launched back in 2000, the storyline will be familiar. The action centres on a slimming club in the Headingley area of Leeds (Mellor’s own stomping ground), and follows the lives of the yo-yo dieters as they ride the rollercoaster of life – and the dreaded weigh-in scales. Jodie Prenger, the winner of BBC1’s I’d Do Anything (2008), takes the lead role of Kelly. 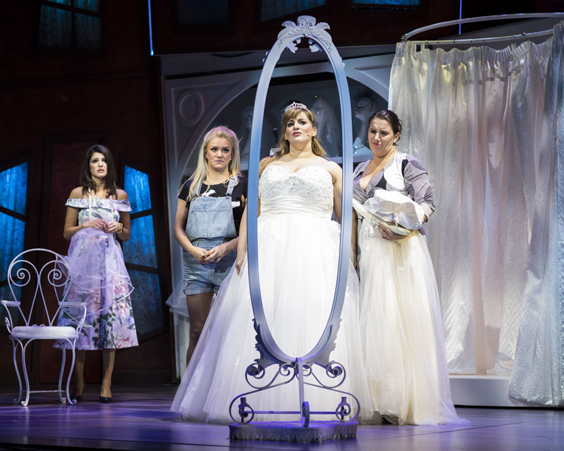 Prenger’s talent and experience shines through as she successfully portrays the young bride-to-be who finds herself being drawn into the world of super-slimmers as she strives to fit into her dream wedding dress. Kelly and her fiancé Kevin (Joel Montague) are lovable characters that have the audience willing them on from the very start. Special mention must be given to the pure power of Prenger’s voice. She owns the stage and it’s not hard to see why she has become an award-winning star. Supporting our main couple are an array of familiar faces. Sam Bailey (2013 X Factor winner), Natasha Hamilton (Atomic Kitten), Natalie Anderson (Emmerdale) and Kevin Kennedy (Coronation Street). Some of the UK dates also feature Andrew ‘Freddie’ Flintoff making his stage debut. This small but perfectly formed all-star cast work fantastically together to produce a show that is big on laughs, love and morals. Kelly and Kevin come up against a few obstacles in their journey to marital bliss, but this is no depressing, heart-wrenching tale. 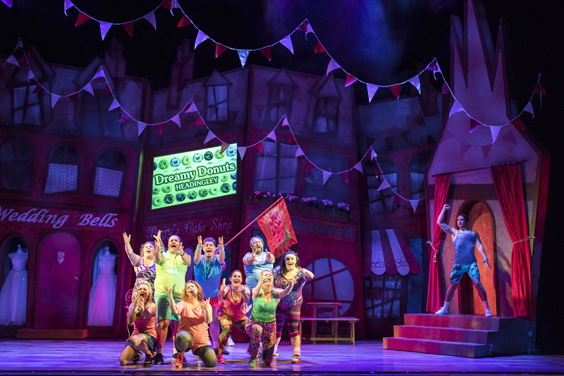 What awaits audiences is a riotous production that opens with a Lycra-clad zumba class featuring slimmers trying their best to whip themselves into shape. As the leader of the slimming club, Lauren (Anderson) tries to get results with kind words of encouragement, as opposed to the owner of the club, Julia Fleshman (Hamilton), who takes a far more patronising and obsessive approach. Both are played with real conviction and style; Hamilton’s vocals are, as expected, excellent, but the quality of Natalie Anderson’s voice is a very impressive surprise. Sam Bailey and Kevin Kennedy play the roles of Kelly’s parents with love and humour, with many a joke coming from the fact he runs a fish and chip shop – the secret hideaway for many a slimmer. The jokes are delivered with as much style as the musical performances, and the musical number ‘If You Don’t Want To Marry Him’, featuring Kennedy, Bailey and Prenger is jam-packed with emotion. Although not yet a household name, I must give mention to Rachael Wooding who takes on the roles of two characters – Joanne, Kelly’s younger, brash sister; and Pippa – Julia Fleshman’s down-trodden assistant. The two roles couldn’t be more different, in fact, it took me until the interval to realise it was the same actress – but the comedy timing shown by this actress is second to none. Considering they are both more minor roles, it really was the standout performance for me. 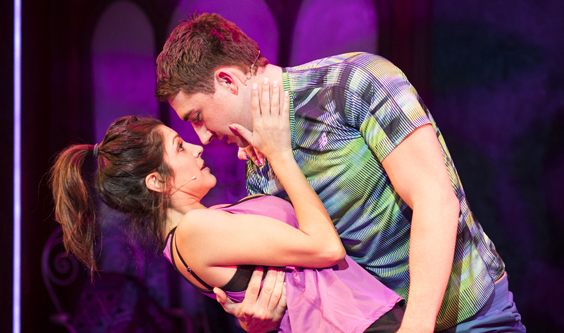 The show’s composer, Nick Lloyd Webber, has hit all the right notes with the music. The emotions of the characters are perfectly mirrored in the wide-ranging styles provided by the orchestra – ballads, rock, pop – it’s all there, but crucially never takes away from those on stage. The set is about as good as any touring stage show you’ll see. Static in the most part, any scenery changes are made seamlessly and without distraction. The winning formula of this production is a storyline everyone can associate with, characters that the audience immediately root for, and music and vocal performances that bring it all to life. Kay Mellor’s first musical is yet another successful string to her bow. In her own words “my intention is for people to have fun… be told a big story, and to love the characters and the world of Fat Friends. Ultimately, I want people to go out singing he songs and, as they do, hopefully realise the message within them and the piece itself – love who you are”. As I leave the theatre and look at the smiles on people’s faces, and hear them singing the tunes, I realise Mellor’s dream has indeed been realised. 2 Comments on "Fat Friends The Musical – Review – Hull New Theatre"
Sounds a brilliant show, wish I had have gone to see it! Absolutely brilliant belly laughs from beginning to end…..